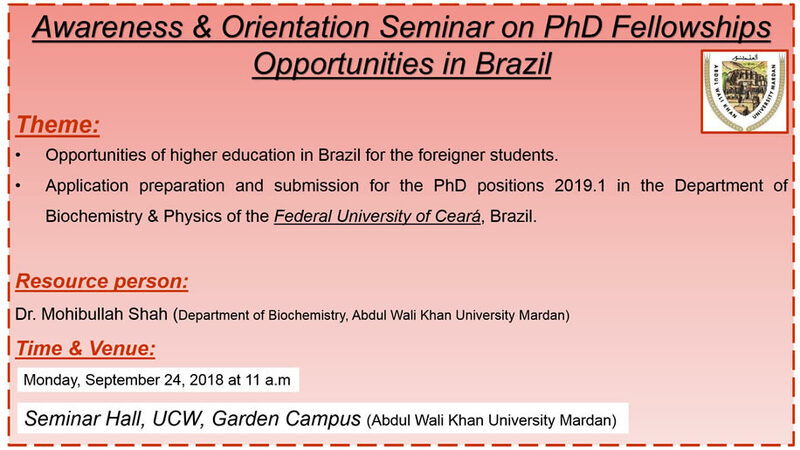 Abdul Wali Khan University Mardan: Seminar on "Awareness & Orientation Seminar on PhD Fellowships Opportunities in Brazil"
Seminar on "Awareness & Orientation Seminar on PhD Fellowships Opportunities in Brazil"
Department of Biochemistry cordially invite students from all the science departments who are seeking for higher studies abroad, to the following seminar. • Opportunities of higher education in Brazil for the foreigner students. • Application preparation and submission for the PhD positions 2019.1 in the Department of Biochemistry & Physics of the Federal University of Ceará, Brazil.